Today in History–May 15–the Library of Congress features The Wonderful Wizard of Oz author L. Frank Baum, born on this day in 1856. 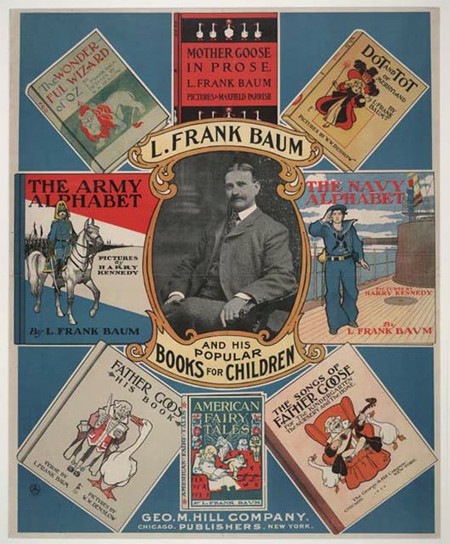 Lyman Frank Baum was in his 40s by the time he became a bestselling author. Learn more about this writer and the extraordinary success of the Oz mass media franchise by visiting the Today in History section, then follow the links below to access all types of Oz primary sources as well as books and stories by Baum* and Oz illustrator W.W. Denslow. *Find more stories by Baum by searching in the Chronicling America Historical Newspaper Collection (click the Advanced Search tab and type L. Frank Baum in the …with the phrase box). Please share any gems you uncover in the comments section or let us know by contacting us.